"Healthy and quick breakfast I learned from friends in Tokyo. Use chilled white or brown rice. Adjust ingredients for your hunger needs and enjoy!" Heat oil in a large skillet over medium-high heat. Spread rice in a flat layer in the skillet; cook until crispy on the bottom, 2 to 3 minutes. Stir egg into rice until scrambled, about 2 minutes more. Sprinkle green onions on top. Season with soy sauce. I am the submitter. Make sure your rice is cold - leftover from evening before kept in frig is perfect. So easy and yummy! I used mainly sesame oil in the pan. Delicious! i made it for dinner adding mushrooms and left over steak sliced thin and a dash of franks hotsauce. awesome thank you. 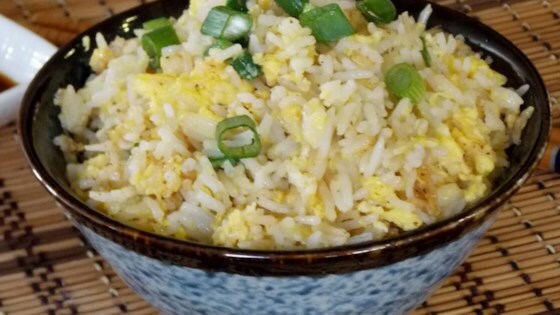 A nice way to use up leftover rice, quick and easy too. This has a very mild flavor, a pretty nice way to start the day. Threw a dash of sesame oil in there and topped with sesame seeds. Was delicious! !